How can I turn off trade offers? You can disable trade offers through your account settings on both web and iOS. This feature will disable trade offers, both inbound and outbound, and will also disable all trade notification emails. You cannot have any outstanding trade offers pending in order to disable trades. To disable trades on the website, go to the account settings page. To reach this page, hover over your profile icon in the top right corner of the site navigation and click on the “Account Settings” link. Once on the account settings page, scroll down past profile information and email subscriptions until you see the following toggle in the YES position. To disable trades, switch this toggle to the NO position. Switch back to YES to enable trades again. To disable trades on the iOS app, go to the account settings page. To reach this page, first click on the profile icon in the bottom right corner of the navigation. You will be taken to the My Profile page of your account. From the My Profile page, you can reach account settings by clicking on the gear icon in the upper right corner of the page. 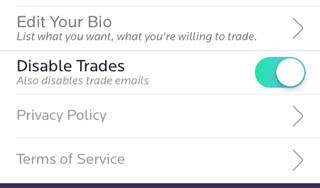 Once on the account settings page, scroll down past your personal information to the Disable Trades toggle. Click on the toggle until it goes to the right and is colored like the image below. Once the Disable Trades toggle is moved to the right, scroll to the top of the account settings page to save your changes and disable trades. You will see the Save button in the top right hand corner after you have switched the toggle. Reverse this process to enable trades again.